The latest TJNL covers the Cracked Glass Technique. Last year when I was at the annual SU Convention they showed us how to do cracked class without having to wait for it to cool, hence the name Faux Cracked Glass. 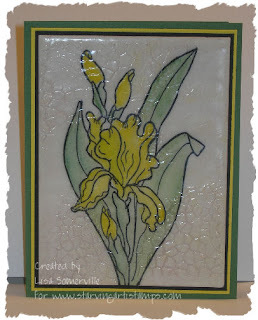 Here I've done the Faux Cracked Glass using the Cracked Grout Mosaic stamp from StarvingArtistamps. Save 10% on your StarvingArtist purchase - click here for details. On to the how to of the Faux Cracked Glass - apply your UTEE just as if you were doing the cracked glass, but on your last layer, while your UTEE is still warm press a background image into your UTEE, let it sit until cooled, then lift off. (I like to put versamark on my image before I press it into the UTEE that way it's easier to lift off.